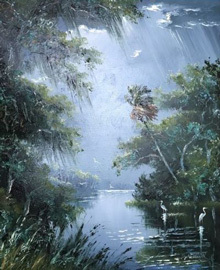 In the early 1950’s through the 1980’s, a group of twenty-six African-American artists known as the “Florida Highwaymen” used vivid and bright colors to display the beautiful untouched Florida landscape. Roy McLendon, one of the original Florida Highwaymen artists, will present a history of this group of primarily self-taught artists, as well as tell first-hand accounts about some of his experiences as a Florida Highwayman. An informal reception will follow Roy’s presentation.